The wonderful city of Mantova fully deserves his inclusion in UNESCO’s World Heritage list and its title of Italian cultural capital for 2016. 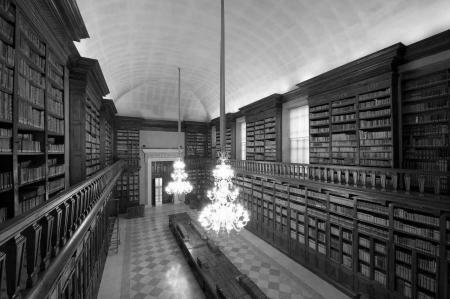 Together with the gentle frescoes by Andrea Mantegna in the famous chamber of Spouses in Palazzo Ducale and the Renaissance gem Palazzo Te, Mantova hides another spectacular place: the Theresian Library. Founded in 1780 by the Empress Mary Therese of Austria and now open to the public, the Library has a similar history to the Braidense Library, strongly desired by the forward-looking Austrian Empress. The library is hosted in an ancient Jesuit College and was developed over the course of years thanks to many and different manuscripts’ and volumes’ collections. Get fascinated by the two marvelous Theresian rooms, covered with large walnut shelves and inspired by the Wien Hofbibliothek’s architecture: Mantova will surprise you again with another wonder.